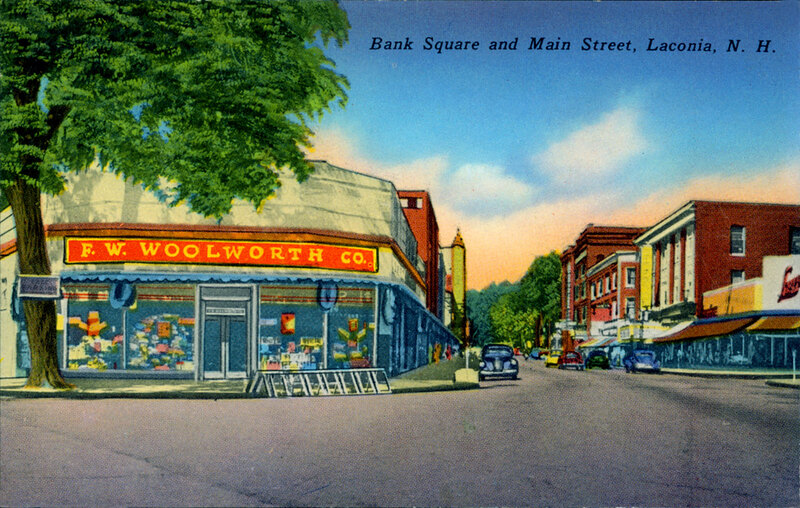 Note below the original location of Woolworth’s “Five and Dime” on the West side of Main St, before it relocated nearby to the prominent building at the corner of Pleasant St and Main St, above. 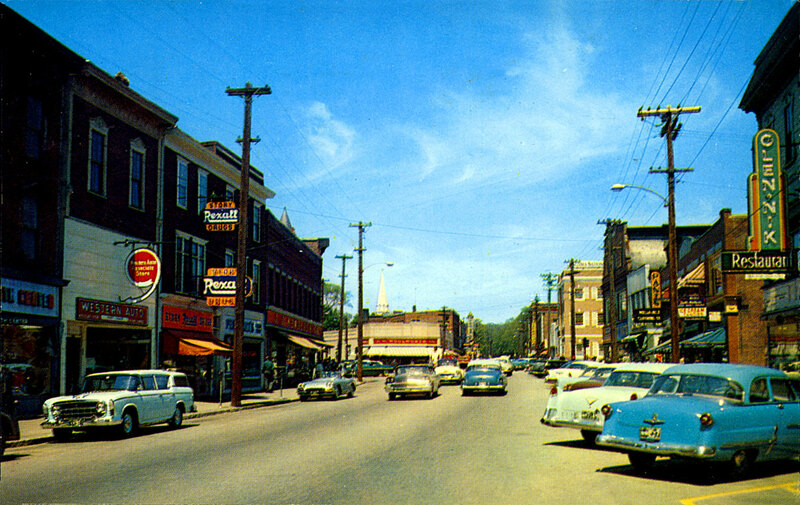 By comparing these two images, we can see that, prior to Urban Renewal, most of the historic buildings on the West side of Main St were still being used well into the 1950s. 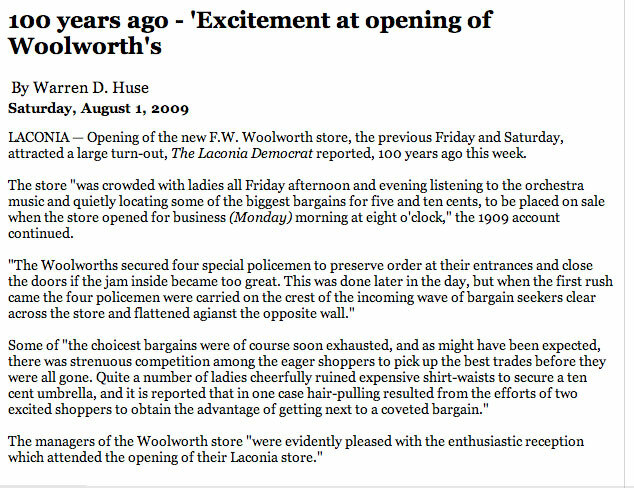 The original Woolworth’s opened on July 31, 1909, according to the following articles. 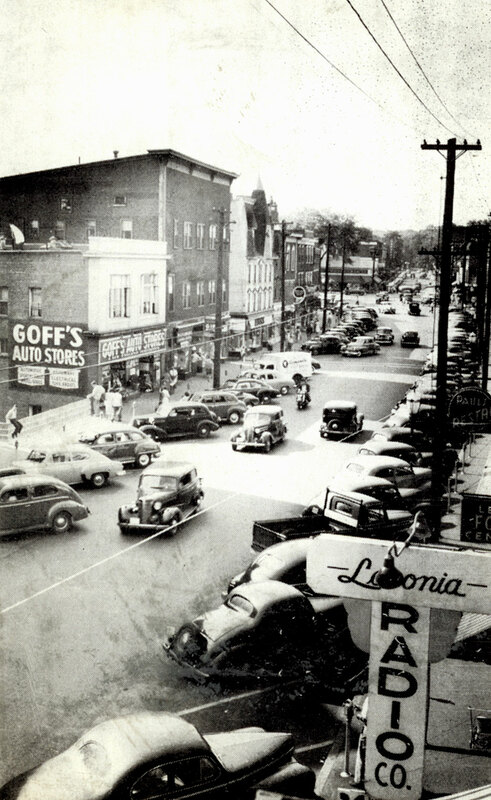 In the early 1950’s photo below, one can see the sign for the (Laconia) Gardens theatre, a nearly 500-seat facility that is currently under consideration for restoration as a cultural arts center. 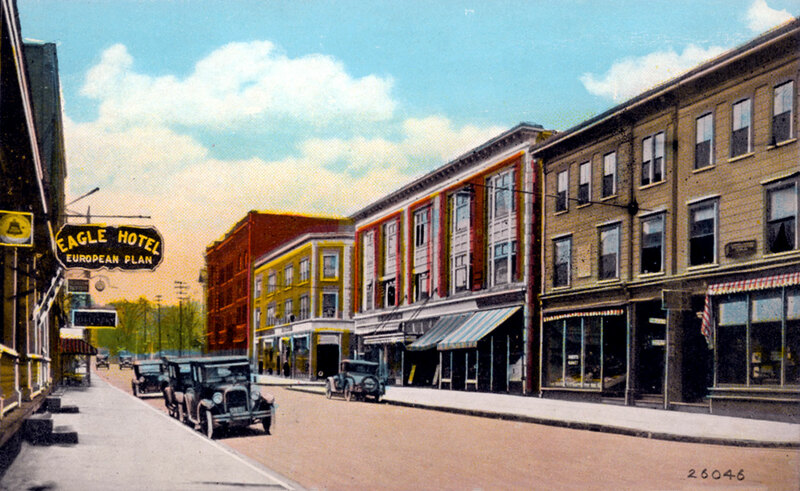 Built in 1926, the theatre was in continuous use until the late 1950’s, and then again from 1972-1977, but has laid dormant ever since. 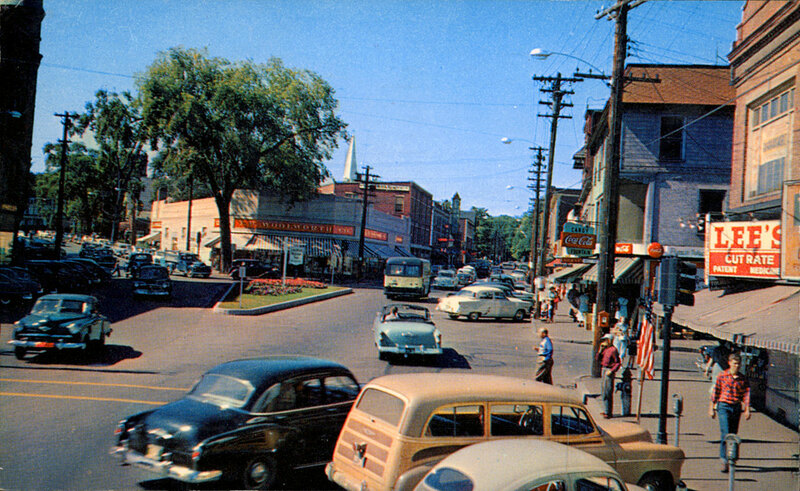 In this late 1950’s photo we can note a few changes: the older Victorian style light fixtures have been replaced by modern street lights, and a traffic island has been installed. 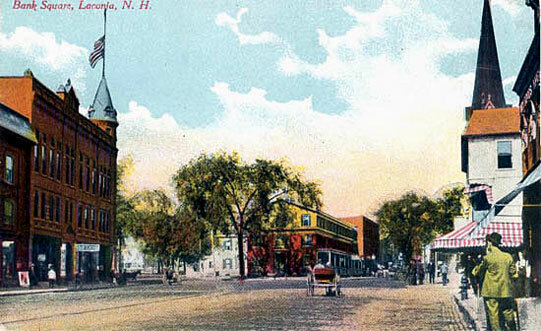 The welcome sign on the traffic island. 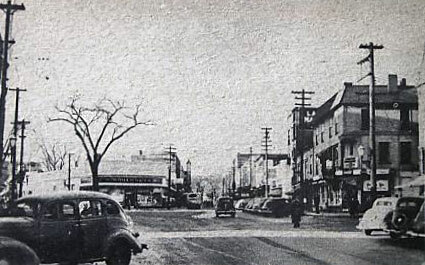 Note the marquee of the Colonial theatre and the movie playing, “Men of the Fighting Lady“. 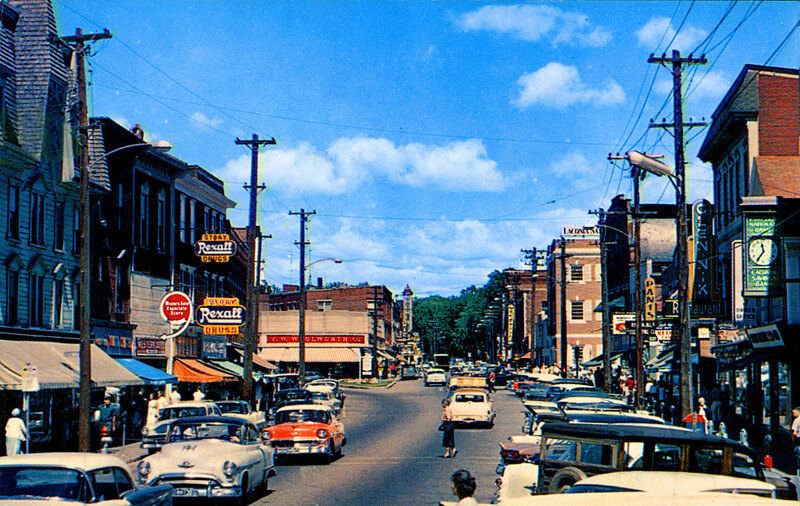 This dates the photo to 1954 or later. 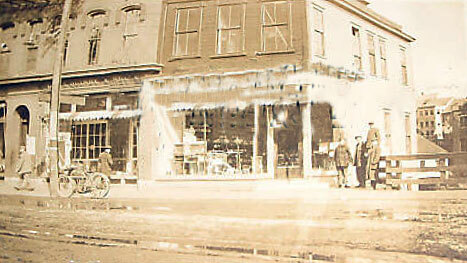 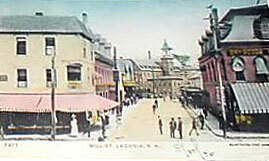 Below: Moulton’s Opera House is flying the flag on the left corner. 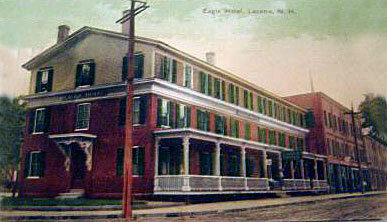 The Eagle Hotel occupies the center. 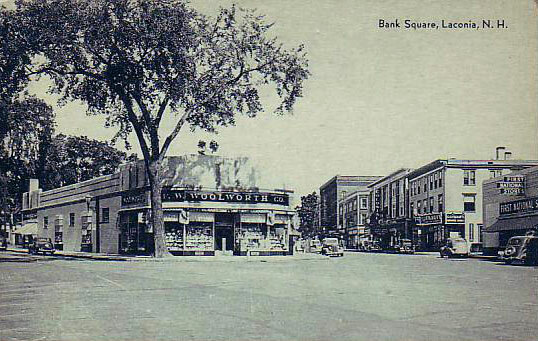 In the 1930’s the structure was replaced by Woolworth’s. 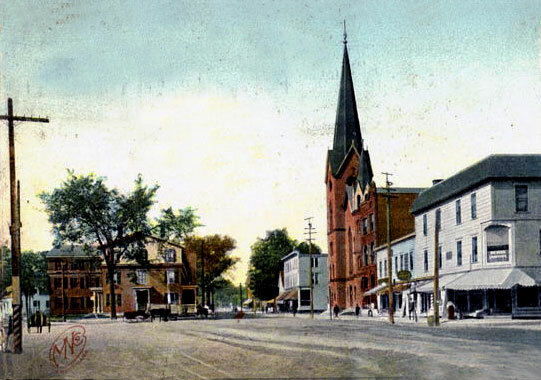 On the right we see the imposing steeple of the Unitarian Church. 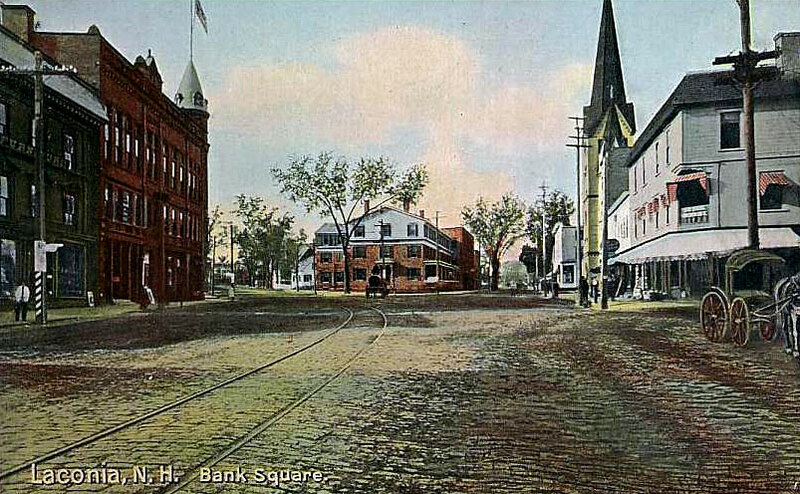 The following are all images of Bank Square. 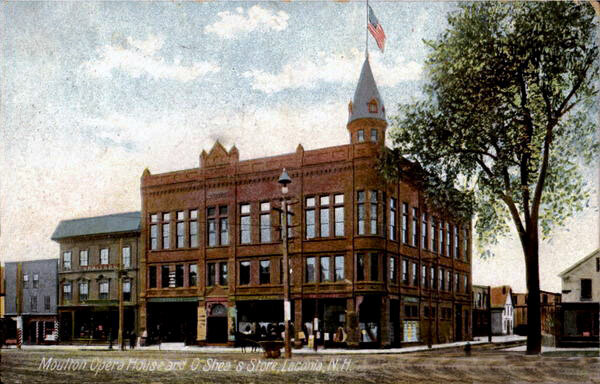 The last two images, taken from a roof top, are in b&w and colorized postcard versions. 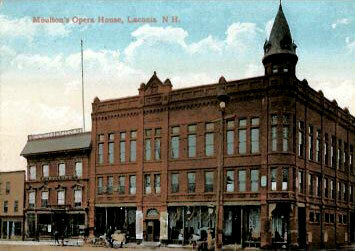 Moulton’s Opera House. 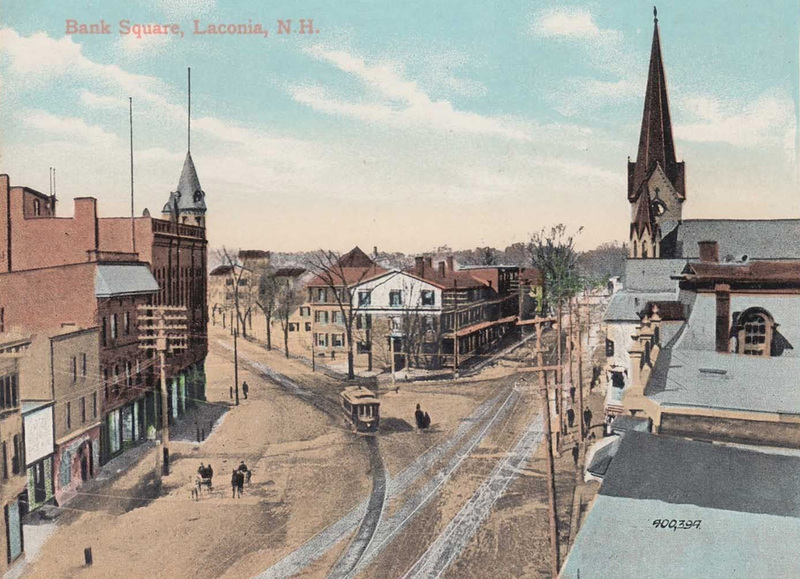 “Built in 1886, this massive brick structure, containing an opera house on its second and third floors, loomed over Bank Square at its corner with Water Street until it was demolished during Urban Renewal in 1970.” Quote from Warren D. Huse’s book, Laconia, Acadia publishing. 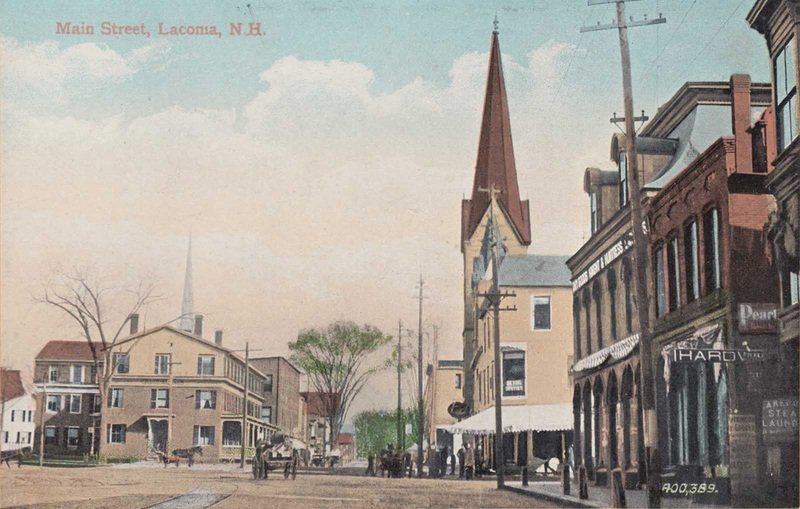 The Laconia Unitarian Church opened on November 11, 1868. 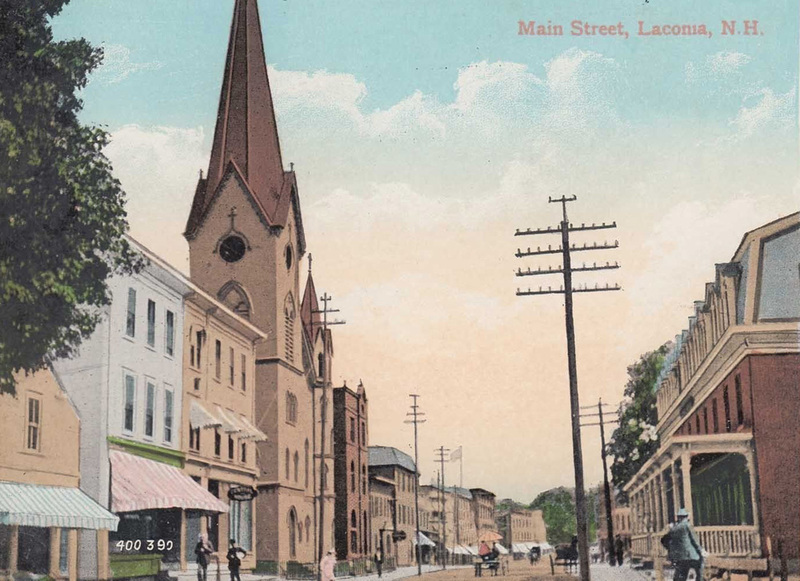 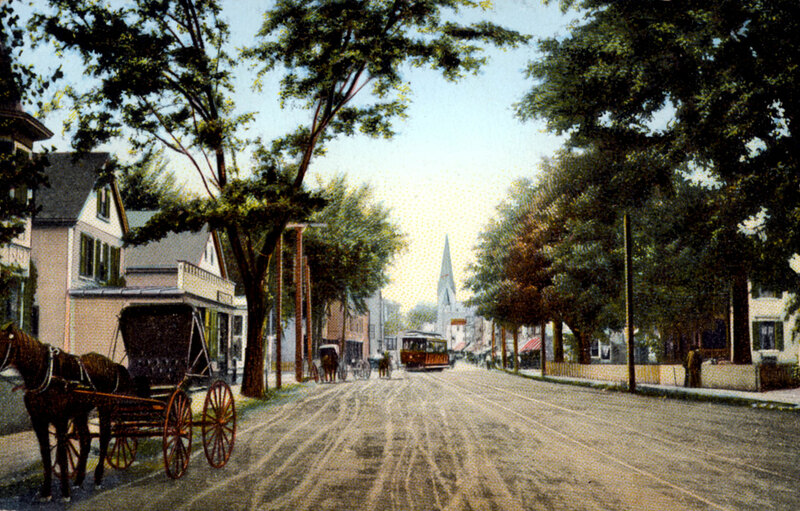 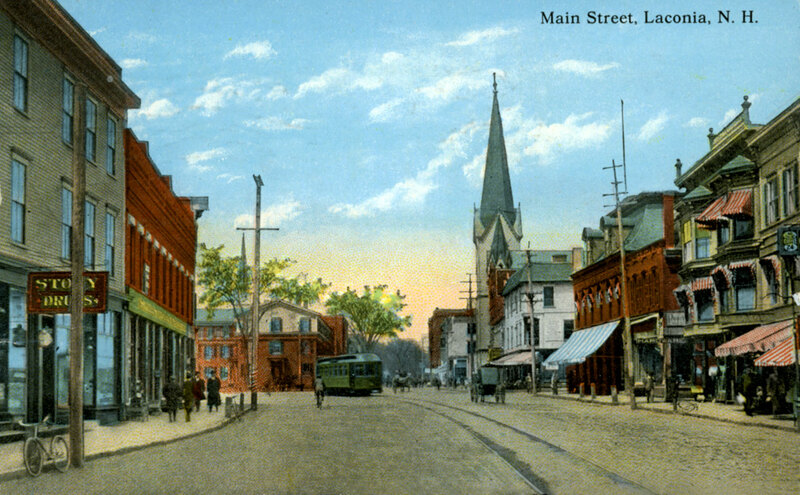 From circa 1890, until 1903, the Church hosted the Laconia Public Library in its basement. 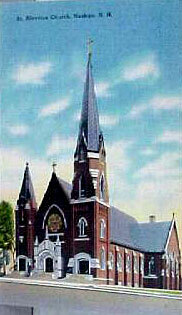 The Church burned down in late 1938. 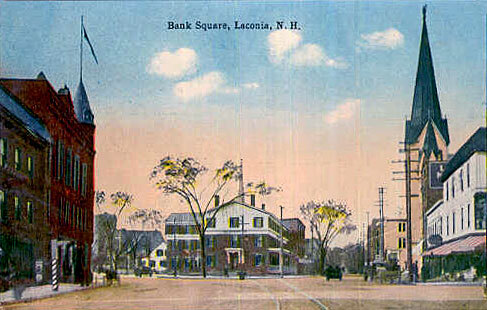 On February 28, 1939, the ruins were carefully brought down, so as not to damage the nearby Laconia National Bank building. 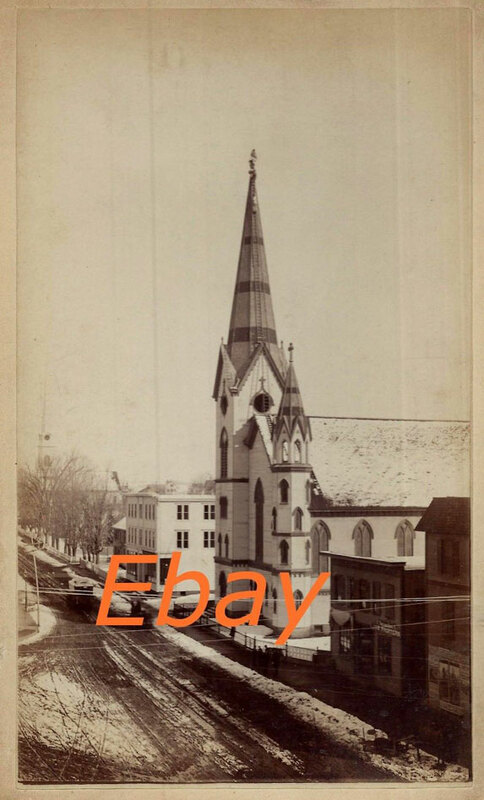 Note the strong similarities between the architectural design of the Unitarian church (above), and of the St. Aloysius church in Nashua, NH, (below), which burned down in 1976. 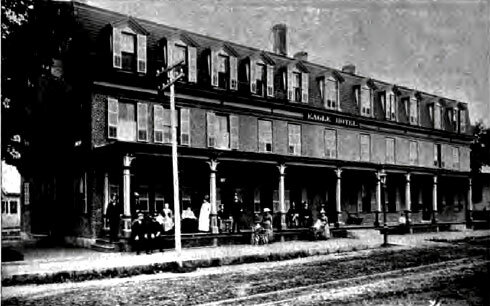 The sign at the front door of the Eagle Hotel. 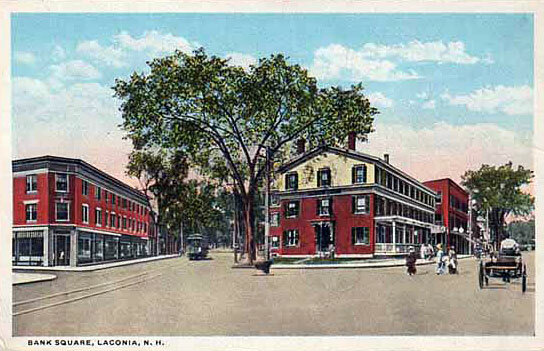 The Colonial Theatre can be seen directly across the street from the Eagle Hotel. 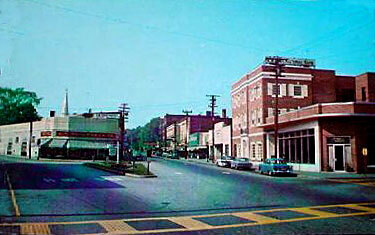 It would be another two decades or so before its garish, 1950’s vintage neon marquee would be installed. 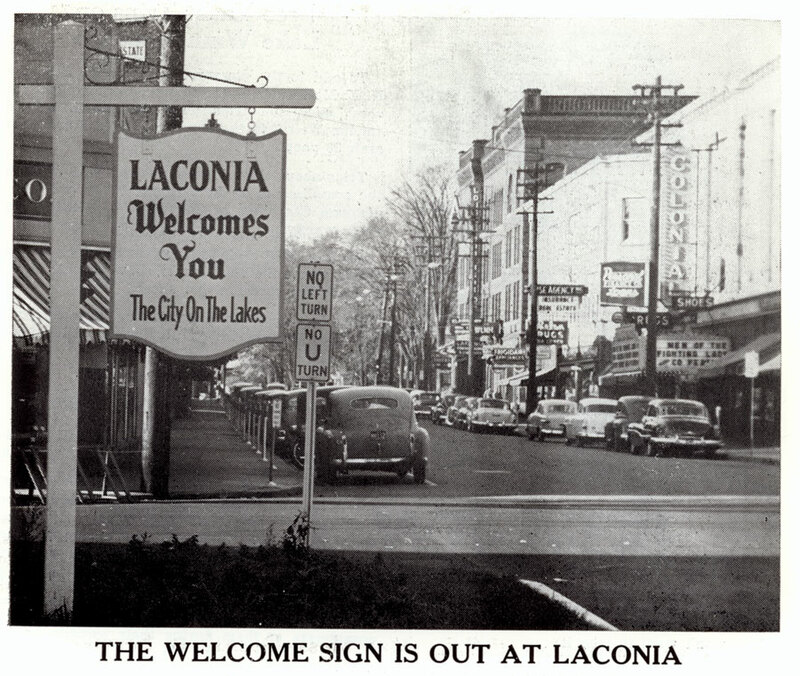 Here is another 1950’s view of downtown Laconia. 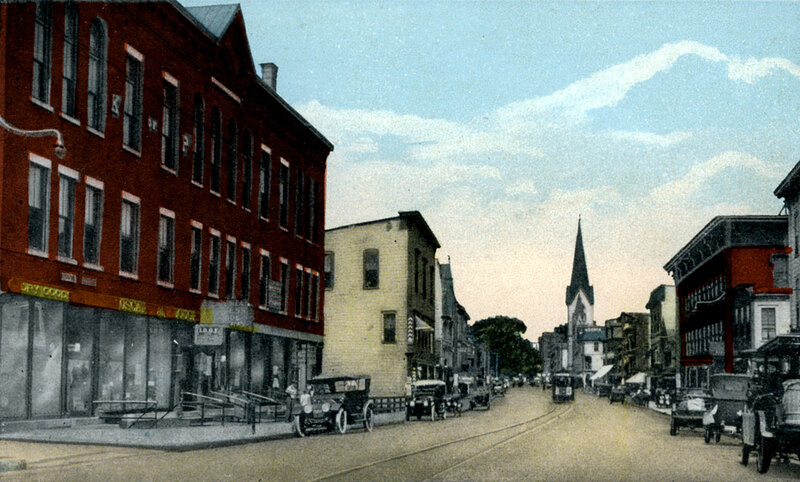 Contrast and compare the late 1920’s view, above, with the early 1920’s view below. 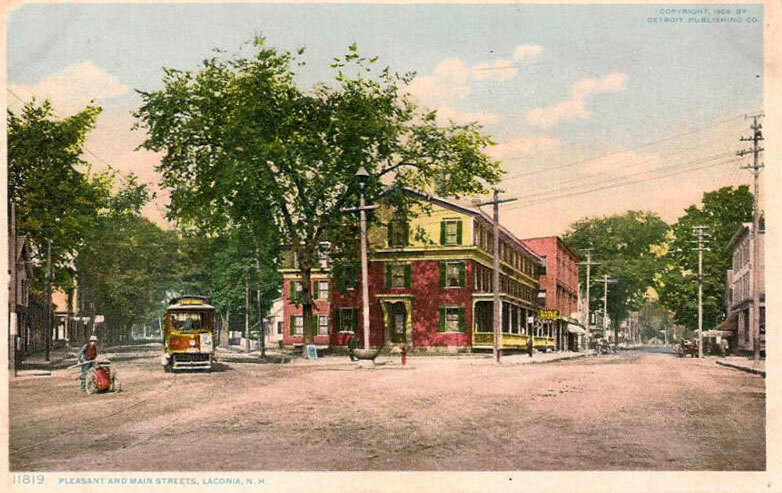 They are very similar except in the later view the trolley tracks are gone ( the last year of operations for the Laconia Street Railway was in 1925.) 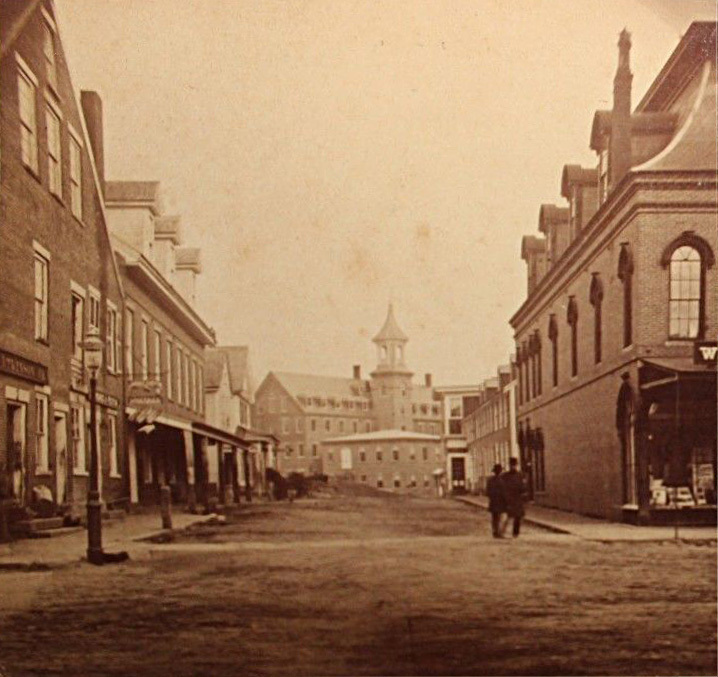 The second, black & white view is from a Library of Congress photo. 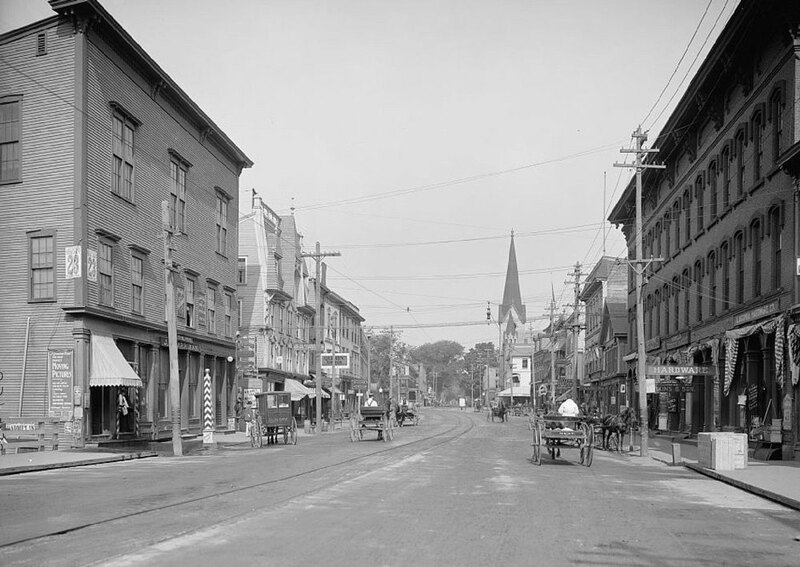 With no cars, just horse and carriages, the black & white view dates around 1910. 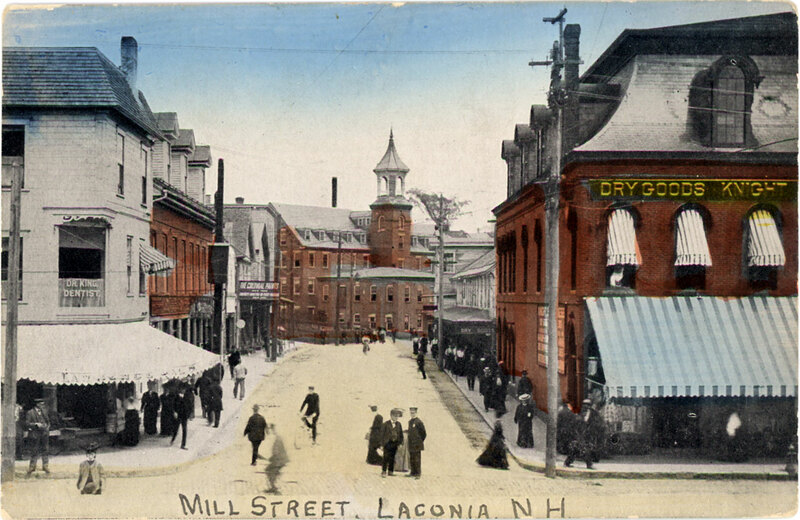 Note: For consistency, the webmaster has only used photos of Laconia’s main street looking in a northerly direction, towards Bank square. 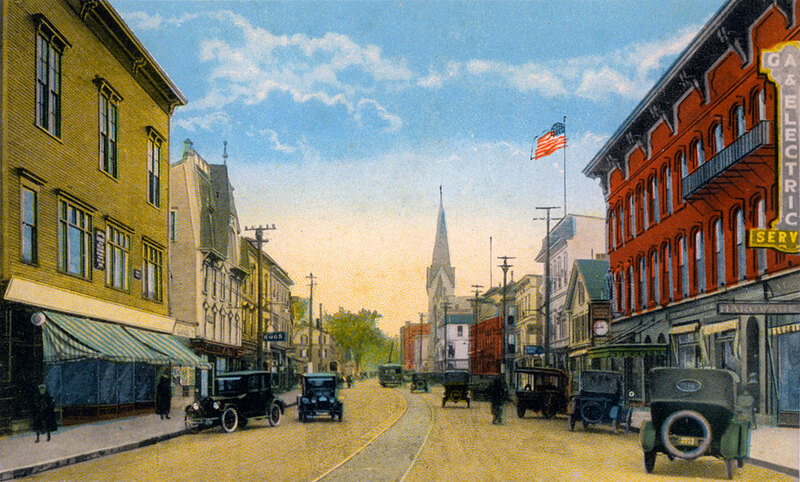 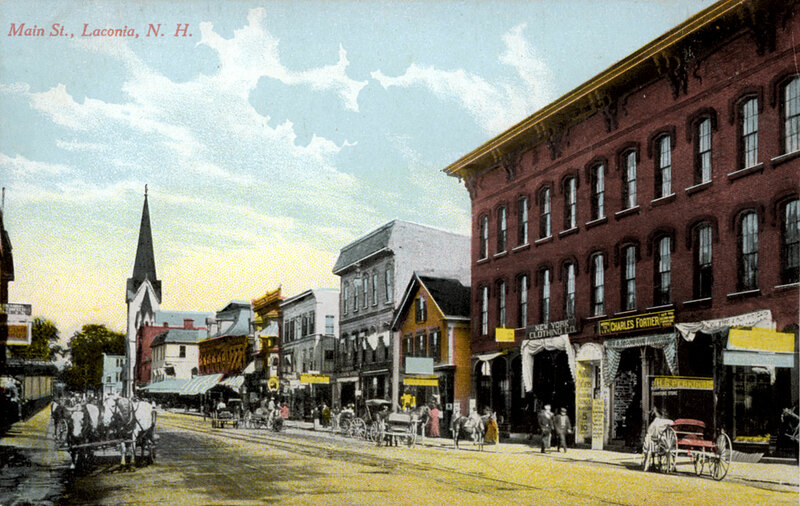 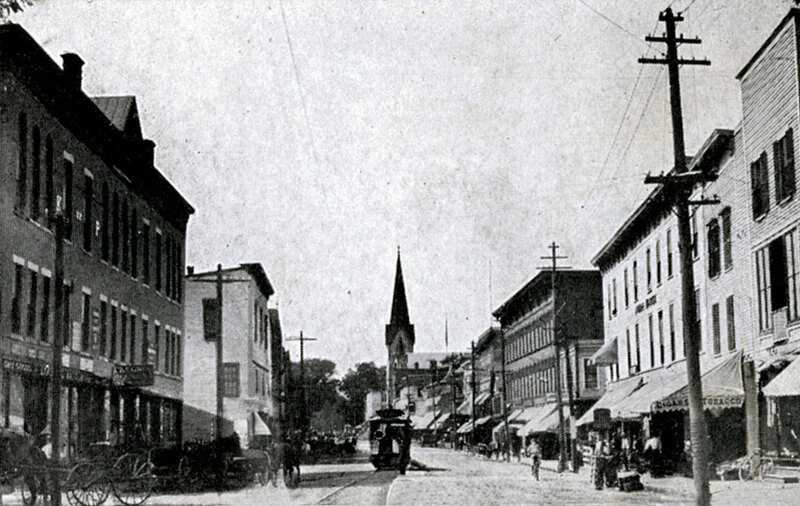 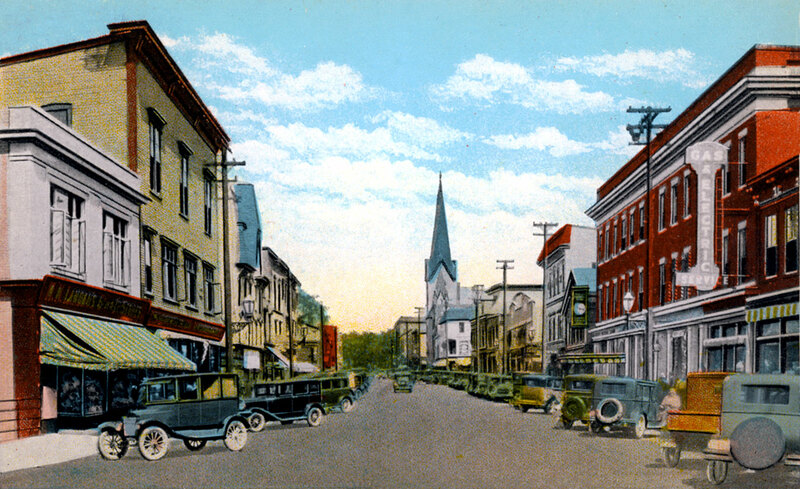 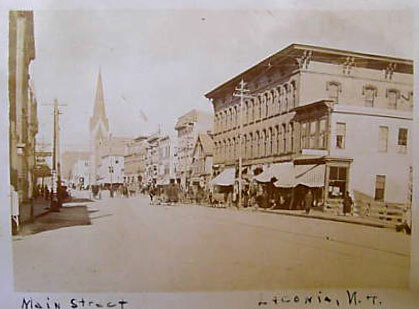 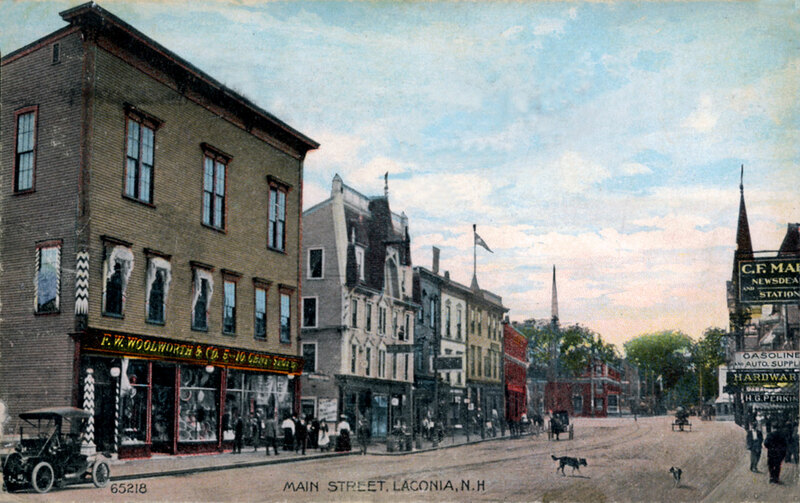 There are many old photos available that look down Main Street in a Southerly direction, beginning from the Laconia Tavern, or from the Eagle Hotel, but they are not nearly as interesting as the photos looking North. 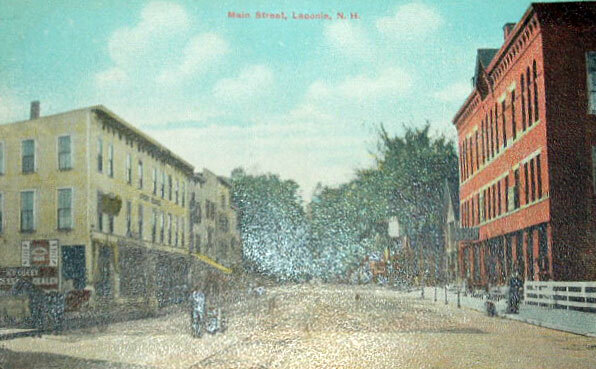 Mill Street no longer exists. 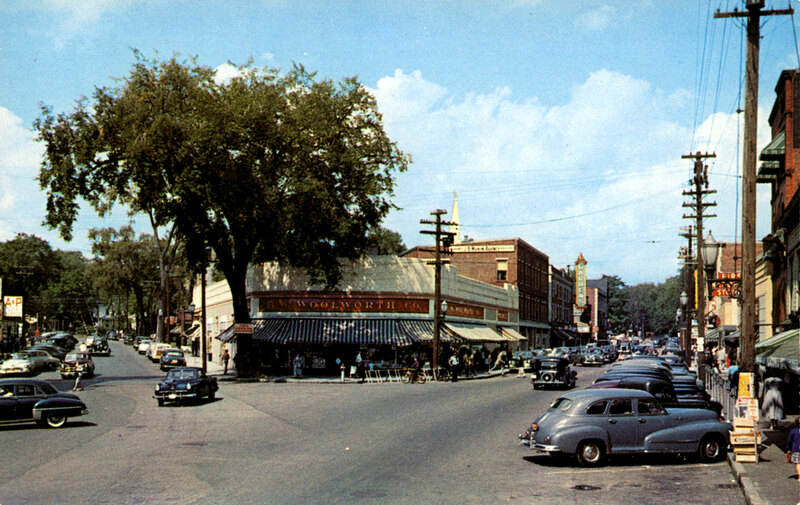 It was another victim of Urban Renewal. 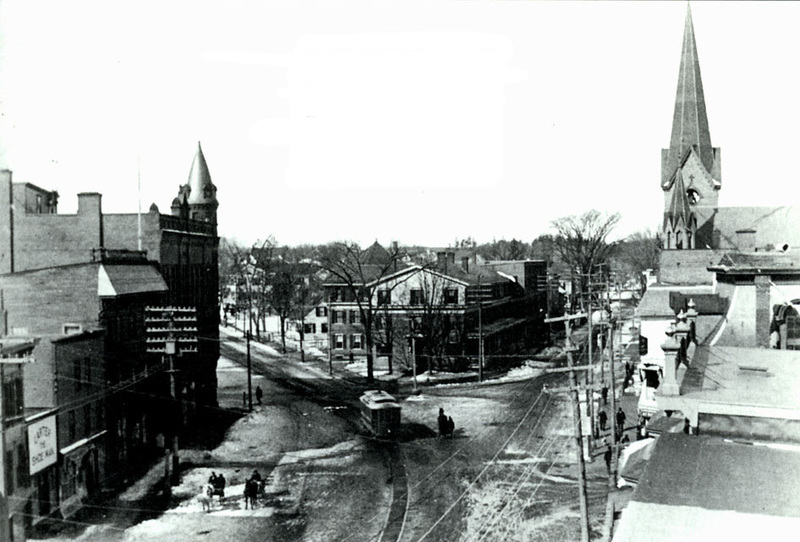 The photo was taken from the rooftop of Moulton’s Opera House, and was the left half of a panoramic view, which can be seen in its entirety here. 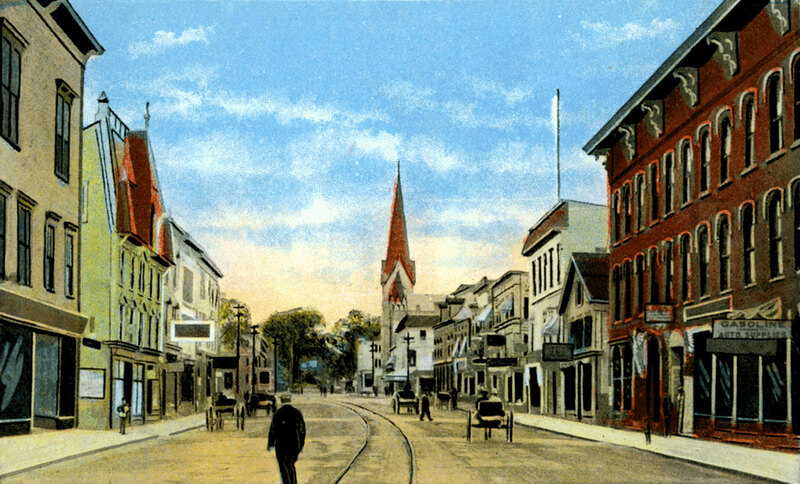 The following North-facing views (from 1907 and 1917) show a bit of the bridge over the Winnipesaukee River, to the right in the photos. 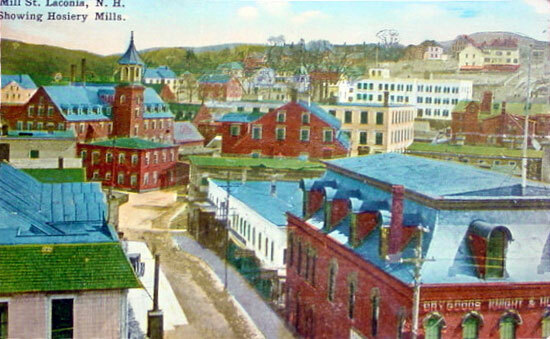 Another view of the bridge over the Winnipesaukee River, this time looking South.